Multiple members of the presidential press pool and a member of Donald Trump's transition team report that Kanye West arrived at Trump Tower in Manhattan on Tuesday. Trump spokesman Hope Hicks reportedly confirmed to the press that West was meeting with president-elect Donald Trump. TMZ reported Kanye will have a 15 minute sitdown with Donald Trump but at 10 am, West and Trump walked down to the lobby and faced reporters. Trump reportedly told the press pool that he and Kanye have been friends "a long time." Trump said that the two "discussed life." The two posed for pictures together and shook hands before they left and Trump told West, "You take care of yourself, I'll see you soon." According to members of the press, Kanye declined to answer any questions. A report from E News suggests that West was invited to meet with the president-elect because "Trump is interested in getting West involved in an 'entrepreneurial leadership role.'" The visit to Trump Tower is Kanye's second public appearance after being discharged from UCLA Medical Center on November 30. 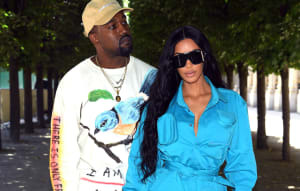 Before his hospitalization, Kanye West gave a controversial speech to fans at a show in San Jose, California on November 17. "I told y’all I didn’t vote, right?” he said. “But if I would’ve voted, I would’ve voted on Trump.” The Chicago rapper went on to say that "there was things that I liked about Trump’s campaign." Watch video of Kanye West entering the Trump Tower above. On Tuesday afternoon, Kanye West took to Twitter to explain the reason for his visit to Trump Tower. "I wanted to meet with Trump today to discuss multicultural issues," he wrote. Actually presidential transition pool note: "Kanye West just arrived in Trump Tower."